The NFL draft starts on Thursday and two quarterbacks are going to be chosen with the top two picks. That means that there will be plenty of Peyton Manning/Ryan Leaf comparisons for Andrew Luck and RGIII. From there everyone will talk about how much of a turd Ryan Leaf was, hopefully they show this video, and then they’ll likely end with how sad it is that he is now a felon and is facing a potential 50 years in jail. With the saying “any publicity is good publicity” in mind, I guess now would be a great time to unload these two 1998 Topps Ryan Leaf action figures since he’s been in the press a lot lately. Back in 1998 this dude was thinking that he’d make thousands of dollars in the year 2012 when Ryan Leaf was a sure fire Hall of Famer and he had these unopened action figures. Now he’s hoping to just get $10 so that he can buy a Papa John’s pizza while watching the draft. 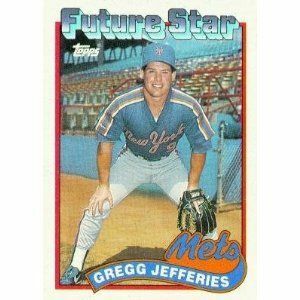 This miscalculation is sort of like how I loaded up on Gregg Jefferies baseball cards with the hopes of one day buying a Lambo with the cash I was going to make.